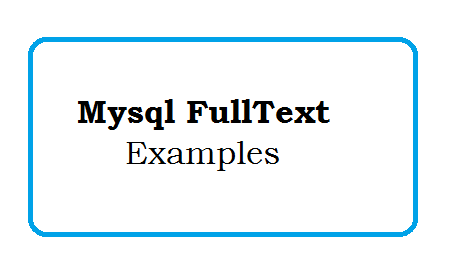 Full-text indexes can be used with MyISAM tables and InnoDB tables (in MySQL 5.6+ only), and can be created only for varchar, char and text columns only. Full-text searching is performed using MATCH() and AGAINST syntax. MATCH() takes a comma-separated list that names the columns in which to be searched. AGAINST takes a string to search for, and an optional modifier that indicates what type of search to perform. The search string must be a string value that is constant during query evaluation. This rules out, for example, a table column because that can differ for each row. 1. A boolean search interprets the search string using the rules of a special query language. The string contains the words to search for. It can also contain operators that specify requirements such that a word must be present or absent in matching rows, or that it should be weighted higher or lower than usual. Common words such as “some” or “then” are stopwords and do not match if present in the search string. The IN BOOLEAN MODE modifier specifies a Boolean search. 2. A natural language search interprets the search string as a phrase in natural human language (a phrase in free text). There are no special operators. The stopword list applies. In addition, words that are present in 50% or more of the rows are considered common and do not match. Full-text searches are natural language searches if no modifier is given. 3. A query expansion search is a modification of a natural language search. The search string is used to perform a natural language search. Then words from the most relevant rows returned by the search are added to the search string and the search is done again. The query returns the rows from the second search. The WITH QUERY EXPANSION modifier specifies a query expansion search. For more information, see Section 12.9.3, “Full-Text Searches with Query Expansion”. Find rows that contain the word “mobile”, but if the row also contains the word “computer”, rate it lower than if row does not. Find rows that contain the words “mobile” and “computer”, or “mobile” and “television” (in any order), but rank “mobile computer” higher than “mobile television”. + Include, word must be present. - Exclude, word must not be present. > Include, and increase ranking value. < Include, and decrease ranking value. ~ Negate a word’s ranking value. * Wildcard at end of word. “” Defines a phrase (as opposed to a list of individual words, the entire phrase is matched for inclusion or exclusion).